There are many reasons why someone would feel unsettled. I will list only a few with dot points – this list is far from being exhaustive! 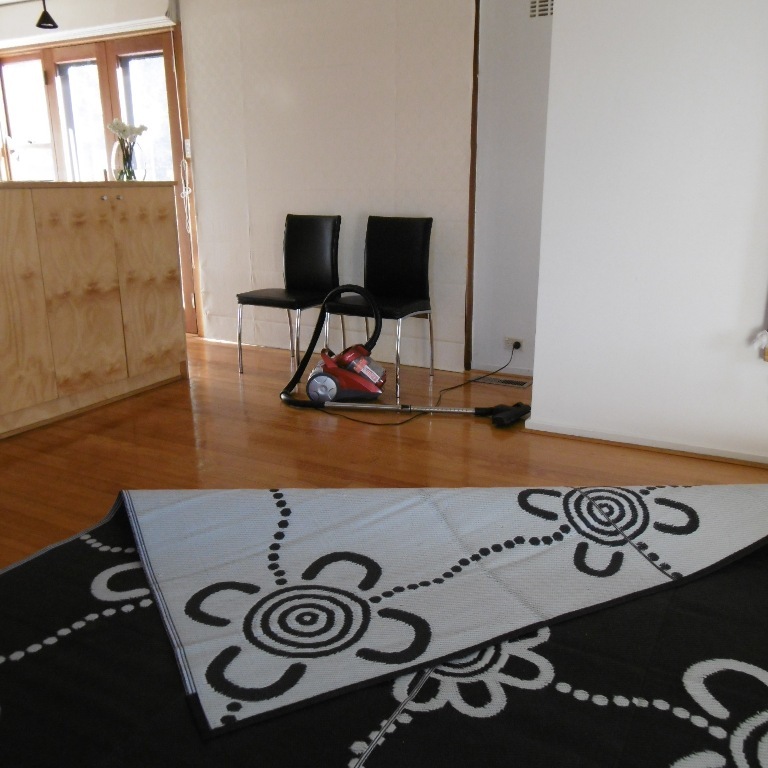 Was this new house built on a aboriginal burial site? Do you still long to your old home? Did you say goodbye to your old house (equally important if you rented or owned it) ? Did you take with you in this new home newly bought antiques or mirrors that had been used by another person? Did you bring in with you in this new place objects of recently deceased people? Is your house located near one of those really high electric poles? or high electric fields? Is your new place ‘closed in’ and were you used before to have a large garden or lived on a big property? What is across of your main entry door? More details from you would be welcomed so I could give you further suggestions. Cheers! 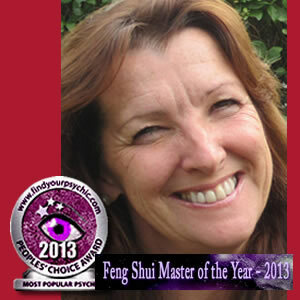 I am happy to help all my readers help themselves with Feng Shui tips. Even though this blog doesn’t replace a Feng Shui consultation with me, I do welcome simple questions via email to which I will answer by placing an article on this blog so that all followers can learn. -> what is it in the resident’s lives that is a bit too artificial? a) The shiny tiled compass is now happily shining with the sunlight and an outdoor mat is doing a great job. b) The artificial flower arrangement is now at the back of the entry door so it is no more the first thing you see when you enter. c) A second shelve is across the first one, they now both host precious and fun objects that are loved by the grand kids when they visit. They also put a smile and bring joy into the grand parents lives when they come home. 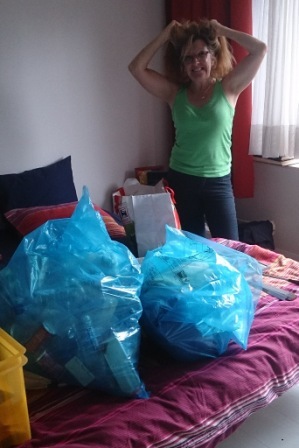 Have you ever felt frustrated seeing all the stuff you (or others) accumulated? 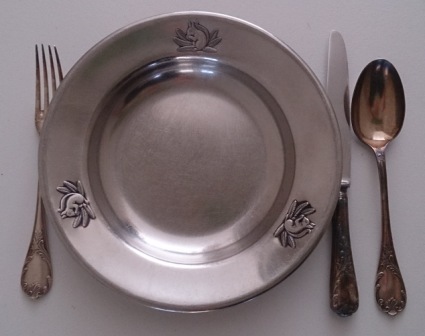 c) clean up your belongings regularly – at the start of each month for example, one cupboard at the time. You will feel lighter and your life will flow better. We need very little to be happy: Nature, good family & friends, great food, comfortable shelter and laughter. That’s what you can call Abundance! Last night with some friends we celebrated the full moon with a themed ritual “Breaking the Cycle”. Sitting in circle all together, each expressed a facet of what most of us wanted to shift. ” I get rid of + … (add here the cycle to break)”. Then, since we are all aware that when we ’empty something’, it often comes back unless we replace it with something else, we had to quickly think of what we were going to replace it with. So the very next sentence was: “I replace this with +… (add here the opposite of what you got rid of). “From now on I get rid of fear and I replace this with I am courageous and excited”. We smoked each person safely with a appropriate protection and local smudge stick and finally we burnt in the full moon that long list of what was holding us back. This morning, I got up and felt the urge to start my day vacuuming and cleaning my floors frantically. I laughed when I was on my knees cleaning my recycled plastic reversible rug with a soft humid cloth! Woaw! After all one of the sentence of a participant was “I stop procrastinating” and I replace this with “I move forward with confidence”. From my Feng Shui point of view, cleaning the floors is lighting our Life Path… this was my impulsive first task this morning before starting any other work. After washing the reversible rug thoroughly and turned it the other way around. This will constantly remind me of this full moon ritual when we broke all those cycles. Rituals are powerful in your life. Be aware and stay safe. ” Dear Roseline, I can’t thank you enough. Came home last night feeling lighter and full of energy. Just as you said, I also had the best sleep. It’s amazing how quickly the universe responds when you put your intentions out there. 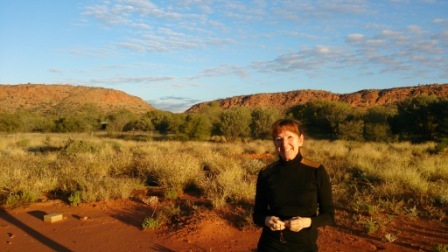 – D.
It’s been a busy few weeks and I finally got to publish my June newsletter today! GREAT NEWS, my best-selling book “Your First Easy Steps to Feng Shui” 4th Edition is now available to download for Tablets & Smart Phones on Kindle/Amazon! This new and updated version is so much cheaper than the printed book! Enjoy your reading and your Feng Shui Experiences! Full moon period is the ideal time for energy clearing. Rather than purchasing a smudge stick online or in a shop, I’d like you to consider making your own! Why ? – Using your local herbs and plants is much more powerful to clear your aura and your home and adding your intent of respect is essential. Ask permission to the plants to cut a few branches and explain what you are about to do with them. 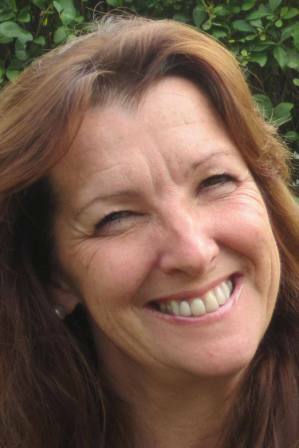 To many readers, this might seem strange to ‘ask permission to plants’ – to me, plants are alive and are happy to participate to what you are planning as long as they are respectfully involved. Ask yourself… How would you feel if someone comes and cuts your hair without warning, simply because you have long hair and this could make a wig for someone else? Same idea isn’t it. Tie them with cotton leaving a little bit of space for air to flow between the branches/leaves, once lit, blow the flames out leaving smoke only. Let the stick dry for a few days or weeks depends on your local climate. Smudge safely and with care! Playing with fire always request common sense and care. Look around you, watch for kids and people and also at the environment where you will proceed with the cleansing and do so safely. Ask your angels, guides, ancestors (or who you believe in) to accompany you and protect you during this ritual. 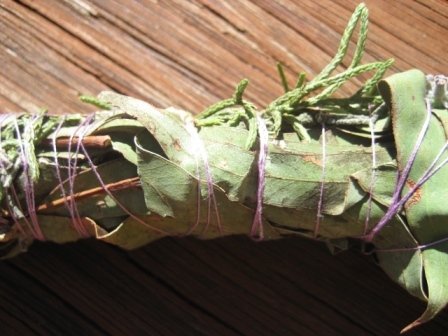 For body as well as for homes, the movement of the smoke FIRST goes anti-clockwise to clear and release the energies; then let the wind take away the negative energies that you just released. After a few moments, process then in a clockwise movement to protect body or/and building. Before this full moon, I made my own and let them dry. I put cypress, lavender, rosemary and eucalyptus together as they were in my neighbourhood. I live in a quiet neighbourhood, the energies here are pure and kind. For those of you living in a busy polluted and noisy environment, I am prepared to sell you those that I made here with love and respect. Email me (through my website) for further info. N.B. This post is for your information only, we don’t take any responsability to what might happen to you during this action. Coincidentally, a couple of days ago, I was at a re-enacting of the funeral ceremony of Bill Neidje, the last surviving speaker of the Kakadu language. 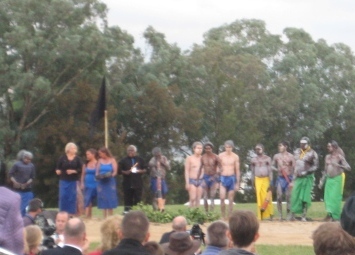 25 March 2014 – Canberra – Reconcilliation Place hosted a very special event. “Extract of AITSIS brochure – LORRKKON ceremony was lead by Binninj ceremonial leader Ronald Lamilami and Yolngu ceremonial elder and artistic Director of the evening’s event, Djakapurra Munyarryun. Both Ronald and Djakappurra led the ceremony at the Hawk Dreaming bone ceremony that was screened on the large media screens during the evening. LORRKKON relates to having the bones placed in a log (or in wooden container) and taken to a secret cave at Hawk Dreaming near the Valley of Bones for safe keeping. This ensures the last surviving speaker of the Gagadju language, Bill Neidjie’s spirit remains connected with his country and allows him and his family to continue their care and lawful management of the Bunitj lands. The ceremony is performed on the specially prepared Bunggul ground. It is a re-enactement of the final part of his funeral ceremony. 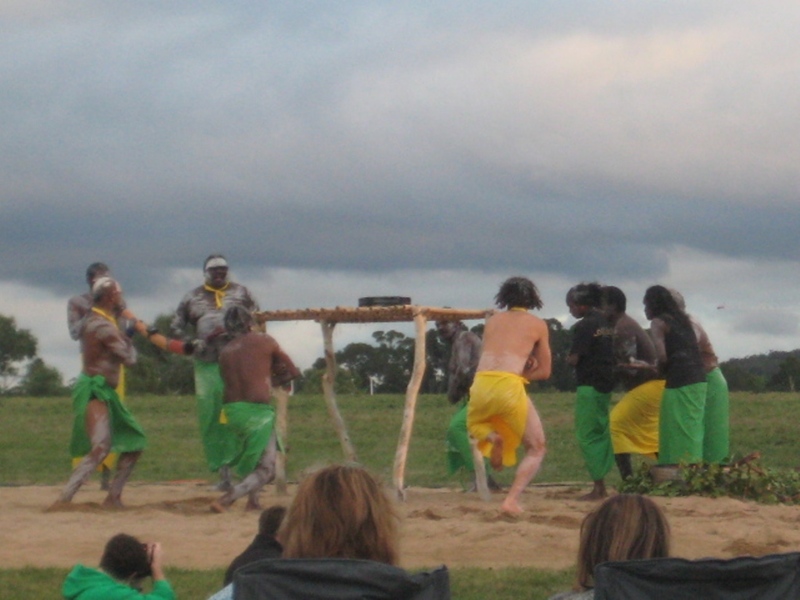 However, unlike the original, it does include women and men as tonight it involves a public aspect of this ceremony that involves the handing over of the film footage by the East Arnhem Land Aboriginal people (Yolngu in green) to the West Arnhem land people (Binninj in blue) who are connected through family and songlines. The footage was then passed across by the Binninj ceremonial leaders to the old man’s children and grandchildren to handover to AIATSIS who become the new guardians of this precious and rare archive. 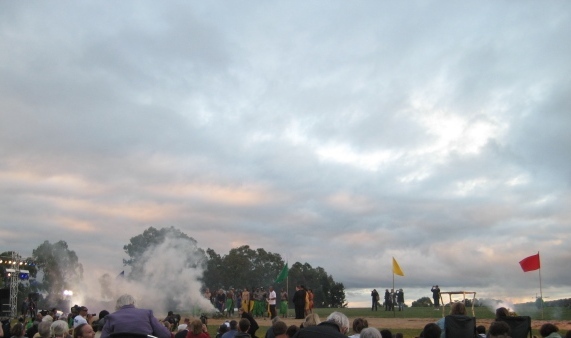 Following the ceremonial handover and acceptance speeches, the group return to the centre of the Bunggul ground for a cleansing smoking ceremony. It was a very touching event where unfortunately the Prime Minister of Australia, The Hon Tony Abbott MP couldn’t attend in person due to other commitments. I am glad I was there. 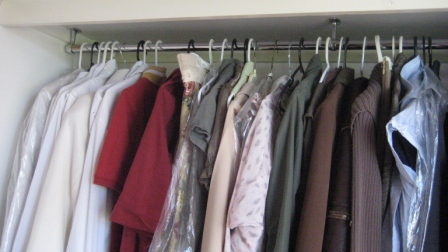 A cupboard a day… Happy everyday! 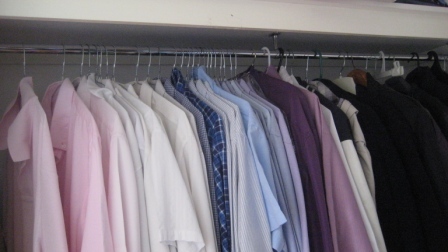 I emptied half of my wardrobe to symbolically welcome a potential relationship. When I was ready, I then activated Chi in my Feng Shui “Relationship” sector at home and after putting my clear intents into an exciting Feng Shui collage, I got my amazing results! Since the arrival of this man into my life, I had to seriously do more de-cluttering and bring both our harmony into the place: I re-organized and de-cluttered inside my cupboards. One cupboard a day… Happy everyday! I always wonder how I could have accumulated so much unnecessary stuff. Yesterday, I emptied my pharmacy cabinet, threw left overs of cream waiting in silent bottles as well as old medication that ran out of date. Since the start of this process, I feel lighter, brighter. Many cupboards are now clean and well organized… so are our ideas and priorities in life, our relationship is in harmony too. When you are happy your relationship thrives. What you scan in your home influences your happiness.